The Terminator™ water filtration systems have the capability of removing Iron, Sulfur, Manganese and turbidity from water. The Terminator Plus™ systems combine all of the removal capabilities of the Terminator™ with the additional ability to raise the pH of acid waters. The Terminator™ systems perform all of the functions without the use of chemical regenerants like potassium permanganate, chlorine or sodium chloride. Please note that both the Terminator™ and Terminator Plus™ systems will not remove Hardness. A properly sized Water Softener should be installed to correct Hard water problems. All water treatment devices, including the Terminator™ systems, possess different capabilities and limitations. A complete water analysis, an understanding of the capabilities of the homeowners water system and proper sizing all contribute to a successful installation. (3) Iron Bacteria which is a living organism. The Terminator™ Systems precipitate dissolved solids like ferrous, or clear water, iron into suspended solids. This process is accomplished by introducing air into the water supply thru the air injector which precipitates or oxidizes these solids and filtering them from the water with the filter media. Ferric Iron, which exists in the suspended form, is simply removed by the filter media bed. Iron Bacteria may be detected in the water supply by examining a toilet tank in the home. Long stringy globs of iron present in the tank indicate the possible presence of Iron Bacteria. Iron Bacteria require iron to survive. As an iron remover, the Terminator™ Systems can control small amounts of iron bacteria. A small amount of chlorine should be introduced into the system periodically to control fouling. This is accomplished by attaching a small tube to the injection fitting on the air injector and introducing the tube into a cup of bleach. The chlorine will be drawn into the system when the pump is operating and a vacuum is created across the injector. Serious Iron Bacteria problems should be treated with an alternative treatment device and the Terminator™ Systems should not be installed. MANGANESE - Manganese causes dark brown or black staining of fixtures and clothing to occur. concentration of 1 ppm the Terminator™ Systems should remove the Manganese as long as the pH is not too low. Do not apply the Terminator™ Systems on water supplies where there is Manganese present without Iron. An alternative treatment device should be installed. SULFUR - Sulfur, or Hydrogen Sulfide, possesses a “rotten egg” smell when present in water. into the system by the air injector and the mixing that occurs in the Terminator™ mixing tank all contribute to the removal of Sulfur. A high level of carbon dioxide in water can form carbonic acid which lowers the pH. The oxygen introduced by the air injector and the mixing tank reduces the carbon dioxide making the water less corrosive. The Terminator™ Plus Systems contain an additional filter media in the filter bed designed to raise pH. This media will slowly dissolve into the water supply making it necessary to be replaced approximately every 12 to 24 months. HARDNESS - As previously mentioned, the Terminator™ systems will not remove hardness. 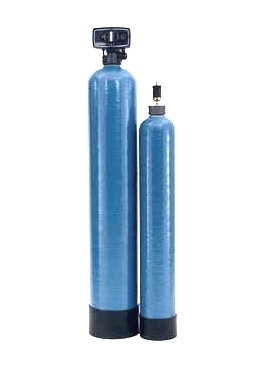 A properly sized water softener should be installed after the Terminator™ System. operate on a nozzle/venturi concept where the fourth option is an air pump which actually pumps air into your water. The operation of the nozzle/venturi air injector - As you can see by the diagram on the following page, as water enters the air injector it is split between the nozzle portion of the injector and the bypass portion. The amount of water entering the nozzle area is regulated by the bypass screw. The further the screw is tightened (clockwise) into the air injector the greater the flow of water into the nozzle. As the water is restricted into the nozzle and enters the venturi a vacuum is formed at this point. This vacuum creates the air draw into the water. As mentioned, the further the bypass screw is tightened into the air injector the greater the air draw during the pump cycle. Also, as the air draw increases the water flow rate through the air injector and to the home decreases. As you attempt to achieve a minimum air draw of 50% of the pump cycle it should be noted that the water flow rate to the home should not be less than the backwash flow rate to the Terminator™ filter or other water treatment devices on the system. This is the standard air injector included with all Terminator™ systems. This plastic air injector features plumbing connections of 1” Male Threads and a flow range for effective air draw of 3.8 - 16 GPM. The Dema 206B Air Injector - This optional injector is constructed of solid brass with 3/4” Female threads and features a flow range for effective air draw of 5.3 - 17 GPM. The Dema 204B Air Injector - This optional injector is constructed of solid brass with 1/2” Female threads and features a flow range for effective air draw of 2.9 - 9.5 GPM. While this air injector achieves air draws at lower flow rates, it should be noted once again that you cannot reduce the water flow rate below the backwash rate of your equipment. A. Air Pump - An air pump wired to the pressure switch on your pressure tank can be a great option of jet pump systems and other systems with low flow rates. The air pump actually pumps air into your water line oxidizing dissolved solids without the restriction of an air injector. Consult the installation diagram provided with the air pump for proper application. off at 50 psi. Please keep in mind that the pressure switch must be installed AFTER the air injector as illustrated. A good quality pressure tank should be installed to insure sufficient run time on the well pump. Residential Applications with Honeywell Air Release: As oxygenated water enters the mixing tank it is sprayed thru a series of holes enhancing the oxidation process and venting excess oxygen from the water supply. Water is picked-up off of the bottom of the tank by an outlet tube as it exits the tank. The excess air is picked-up by a small tube and vents to an air release located on the top of the mixing tank. The air release features both an on and off position which allows for disassembly without turning off the entire system. The air release should be in the OPEN position when operation allowing excess air to vent to drain. The air release fitting and tubing should be attached to the air release and run to an open drain. The tubing will direct any water discharged by the air release to the drain. Make sure you adhere to local plumbing codes when installing this tubing at the drain. tank. The excess air is released thru the Whitewater Air Release located inside the tank. of the air injector. plumb drain tubing from the top of the tank to an open drain. The drain tubing will direct any water discharged by the air release to the drain. Make sure you adhere to local plumbing codes when installing this tubing to the drain. See the installation instructions provided with the air release for additional information. As the oxygenated water enters the filter tank the precipitated iron is filtered by the media in the tank and any dissolved iron left in the water is removed by the media. The Filter tank should be backwashed approximately every three days to clean the bed and redistribute the filter media. Terminator™ Systems - The standard Terminator™ systems contain a mixture of BIRM and FILTER AG. catalyst filter for iron and manganese reduction. a general purpose filter medium. COROSEX - Corosex is a reactive magnesium oxide used to correct low pH conditions of water. and proper sizing all contribute to a successful installation.